Hapua School, Parenga – sewing class (c.1900). P1990-015/49-328. Hocken Collections, Uare Taoka o Hākena, University of Otago. This wonderful candid scene from the far north has turned up as an illustration several times over the years, captioned briefly or sometimes not at all. The sewing class image from Te Hāpua School is intriguing, prompting questions about the people, time and place, and it deserves to be more than an illustrative aside. This post looks behind the scene in an attempt to embroider a more detailed background to the sewing class on the veranda. Most sources, like the Hocken, have estimated the date of the photograph to be approximately in the early 1900s, but Robin L. Shepherd, author of Te Hapua School: our 75th year identified the year as 1904 and the teacher as Mrs Greensmith. By 1904, Te Hāpua Native School had been in existence for eight years and Edwin Greensmith was the school’s third principal. His wife, Isabella Cleland Lloyd, was the assistant teacher. They arrived at Te Hāpua the year this photograph was taken and the wooden building seen in the photograph replaced the original raupō schoolhouse with its mud floor just five years earlier. Edwin and Isabella taught at Te Hāpua for only three years while raising their young family. Single men were not allowed to teach at native schools until the 1930s, and the majority of the head teachers in Te Hāpua’s first 75 years were men whose spouses shared the teaching load. The author of the history booklet, Robin L. Shepherd, was himself Te Hāpua’s eighteenth principal, starting in 1969, and his wife Gena Shepherd was the assistant teacher. Te Hāpua School (initially called Pārengarenga Native School) was established in 1896 with Lucy Irvine as the first head teacher. The community had spent many years petitioning the Education Department for a school. The Ngāti Kurī people actually wanted the school at Kapo Wairua, even further north than Te Hāpua. However, the Education Department maintained it was too remote and it was easier for them to get a teacher and supplies to Te Hāpua instead. At that time, Te Hāpua was a lake called Lake Hōpua and in order to get the sorely needed school Chief Murupaenga of Ngāti Kurī drained the lake and set up a papakāinga there. In an historical account in the Ngāti Kurī Deed of Settlement, a retired politician commented that the area might have suited the Education Department but it caused numerous problems for the community including inadequate road access, flooding, lack of fresh water and deficient soil quality. Indeed, health and access issues plagued the school and its community for many years. During 1906, the Greensmiths’ final year at Te Hāpua, the school closed for much of the year due to a meningitis epidemic. This was not the first time, nor the last, that epidemics forced the school to close. The previous head teacher, Mr Matthews, was moved to provide an extensive report on the health of the local children in 1903, noting “one hundred were ill, and nine had recently died, suffering from coughs, fevers and convulsions” (Ngāti Kurī Deed of Settlement, p.22). Access problems made the trip to school hazardous for many pupils. Shepherd noted the Raharuhi people kept their children from attending Te Hāpua fearing they might drown crossing the Waitiki River. This prompted Mr Greensmith to offer the use of his boat to ferry pupils safely to school. Portion of: Te Hāpua / drawn by N.M. Dudley. Wellington N.Z. : Lands and Survey Dept., 1959. 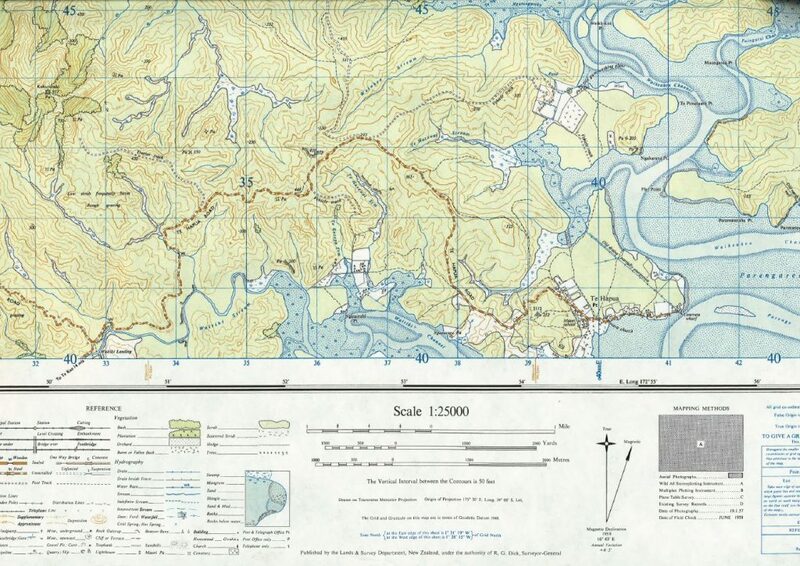 Hocken Maps H++ 830/NZMS2/N2/7 1959. Hocken Collections, Uare Taoka o Hākena, University of Otago. Although it was drawn over fifty later, the map shown in part above is beautifully detailed and gives us more of an idea of the topography of Te Hāpua and its surroundings. The Waitiki Channel and stream, which was a problem for many children on their way to school during the early years, can be seen to the west of Te Hāpua as well as areas of mangroves and swamp. The Hocken holds a physical copy of this map and the National Library has made a digitised version available. Portion of: Topographical survey of the country between Hohoura Harbour and the North Cape. Wellington. N.Z. : Dept. of Lands and Survey, 1899. Hocken Horizontal Maps 841 1895a. Hocken Collections, Uare Taoka o Hākena, University of Otago. The lovely watercolour map by T.K. Thompson shown above is earlier, from 1899, and marks the location of Te Hāpua School (“Native School”) to the south of Manuka flat. The sewing class scene depicts a time when practical skills were prized and made a compulsory part of the school syllabus. In fact, the government wanted all schools, not only native schools, to focus on these more so than academic learning. To this end the Native School Standards of Education (in section 4 of the Native Schools code, 1880) stipulated that girls were expected to be able to thread needles and hem by the end of standard 1, and by standard 4 “to do button-holing, to sew on buttons, to darn stockings, and to be learning to knit stockings”. Some of the girls in the photograph are taking measurements, which suggest they may have gone beyond the syllabus into altering or making new garments. An important part of any photograph’s story is its creator. Fortunately, The Turnbull Library, which also has a copy of the sewing photograph, has been able to identify the photographer Arthur James Northwood. Arthur and his two brothers, Richard and Charles were all photographers in the Far North from the 1890s to about 1940. They travelled by horseback enabling them to access remote areas taking photographs of the gum fields and the people that worked in them. They also photographed the teachers and pupils of Te Hāpua School. Shepherd’s book includes several images taken by Arthur and Richard Northwood in 1904. Arthur Northwood also took the picture below, which appeared in the Otago Witness in December 1908 (this image does not appear in Shepherd’s history). We all know that photographing children (let alone large groups of them) brings challenges, making “A study in smiles” remarkable with a group of no less than seventeen boys smiling simultaneously for the camera. Northwood, A.J. (1908). 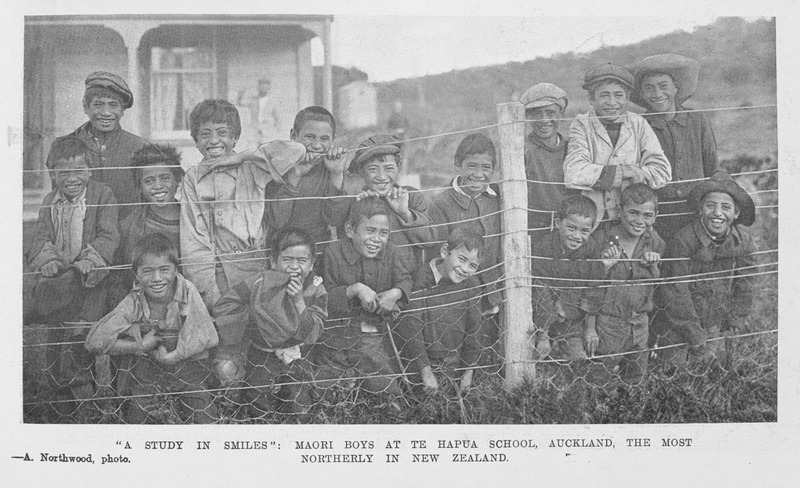 “A study in smiles”: Māori boys at Te Hāpua School, Auckland, the most northerly in New Zealand. Otago witness supplement, 30 December 1908, p.47. Dunedin, N.Z. Hocken Collections, Uare Taoka o Hākena, University of Otago. Clearly, there is a lot more to the sewing class photograph than its simple captions, but research also raises further questions. Who were the children in the photographs? The girls have obviously survived the epidemic of 1903 that prompted school principal Mr Matthews to compile a health report on each child in the area, but how did they fare in the meningitis epidemic the following year? Did Arthur Northwood take the photograph of the boys on the same visit in 1904, and if not, when? Some of the answers may lie in the old school records held in the Te Ahu Heritage Museum in Kaitaia. There is certainly room for more detail to be stitched into the Te Hāpua sewing class scene. Barrington, J.M., & Beaglehole, T.H. (1974). Maori schools in a changing society: an historical review. Wellington, N.Z. : New Zealand Council for Educational Research. Dragicevich, K. (2015). The gumfield collection: 100 years on – looking back: photographs by Arthur and Richard Northwood, 1898-1940. Awanui, N.Z. : Willow Creek Press. 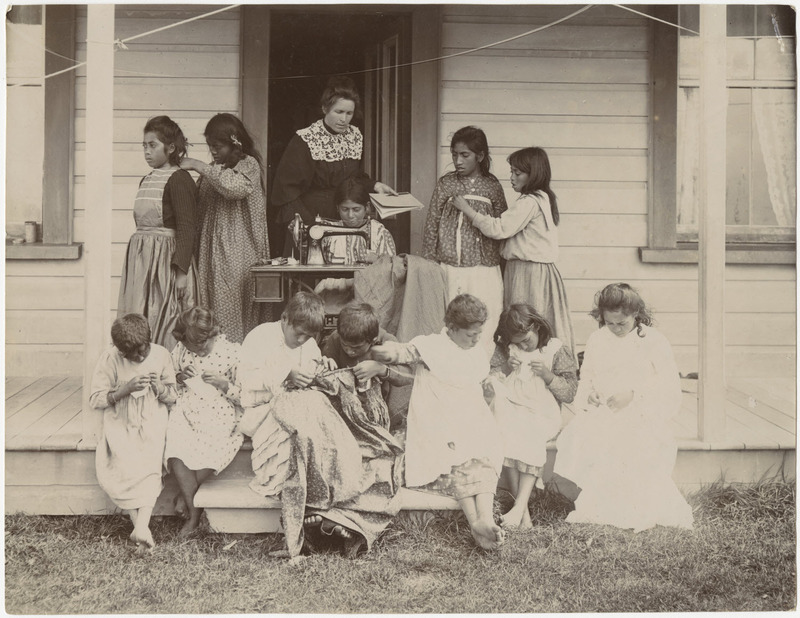 (Hapua School, Parenga – sewing class c.1900) [photograph]. P1990-015/49-328. Hocken Collections Uare Taoka o Hākena, University of Otago. Mead, Sidney M. (2016). Tikanga Māori: living by Māori values. Wellington: Huia Publishers. Northwood, A.J. (1908). “A study in smiles”: Māori boys at Te Hapua School, Auckland, the most northerly in New Zealand. Otago witness supplement, 30 December 1908, p.47. Dunedin, N.Z. : Josian Lye for the Otago Daily Times and Witness Newspapers Co.
Shepherd, R.L. (1971). Te Hapua School: our 75th year. Te Hapua, N.Z., Te Hapua School. Simon, J.A., Smith, L.T., Cram, F., and University of Auckland. International Research Institute for Maori and Indigenous Education. (2001). A civilising mission? : perceptions and representations of the Native Schools system. Auckland, N.Z. : Auckland University Press. Te Hapua / drawn by N.M. Dudley [map]. 1959. Wellington N.Z. : Lands and Survey Dept. 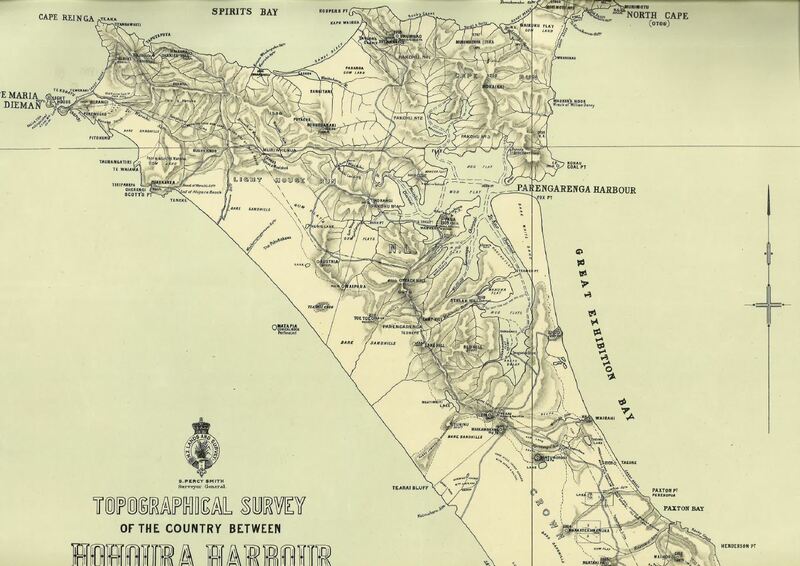 Hocken Maps H++ 830/NZMS2/N2/7 1959. Hocken Collections, Uare Taoka o Hākena, University of Otago. Topographical survey of the country between Hohoura Harbour and the North Cape [map]. Wellington. N.Z. : Dept. of Lands and Survey, 1899. Hocken Horizontal Maps 841 1895a. Hocken Collections, Uare Taoka o Hākena, University of Otago.